Hey! Did you guys know you have two chances to win a GoPro HD Hero video camera this week? 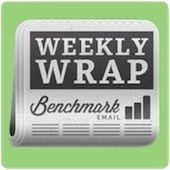 Just subscribe to the Benchmark Email YouTube channel for your shot at winning. Plus I’ll remind you a few more times in this edition of the weekly wrap. Would You Pay to Post on Tumblr or Facebook? Technically, my job is the exact opposite of that question. However, those social networks need to ask, Would You Pay to Post on Tumblr or Facebook? Ask Andy Episode #3: How Do You Increase Social Media Interaction? You bribe them with GoPro HD video cameras to subscribe to your YouTube channel so they don’t miss any more Ask Andy videos... Guilty as charged. Check out Ask Andy Episode #3: How Do You Increase Social Media Interaction? Here at Benchmark, we just do things like provide really great content to increase Like counts. Oh...and also bribe social followers with great prizes like HD video cameras (see above). Read about Facebook Scanning Private Messages to Increase Like Counts. Nobody told me we were going to the zoo...if only there was some under-the-radar or different ways that sort of event could have been marketed to me. See what I did there? Check out these Guerrilla Event Marketing Tips. For every company that asks, “How can we do this like Apple?” there is The Asylum Studios Branding Model: Don’t Innovate! Replicate! I am writing this during our own webinar. It’s also 24 hours after yesterday’s webinar and 24 hours before the one tomorrow. Three birds, one stone. Boom. Learn about Webinar Marketing: What to Do Before, During & After Your Webinar. My cartoon counterpart doesn’t always have the time to say everything he wants in the Ask Andy videos. I’ve got his back. I fleshed out the ideas from the newest Ask Andy video and wrote the Benchmark 5: Ways to Increase Social Media Interaction. #6: Let the Benchmark Easy List Builder App do some of the work for you! Discover the other ways on How to Overcome the Top 5 Tradeshow Challenges.